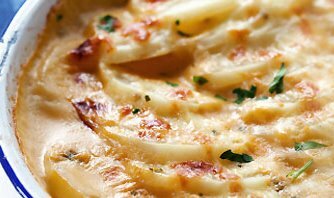 I was craving scalloped potatoes today, so I went online to find one that didn’t include any dairy or gluten. I found one, but didn’t have all the ingredients, plus I didn’t want artichoke in mine. What attracted me to this recipe was that the author has the same feeling about a lot of vegan foods as I do. Using her recipe as a base, this is what I came up with…and it was really yummy (the rosemary really adds a nice flavor to them)! Preheat oven to 350 degrees. In a saucepan, heat the olive oil over medium heat, and stir in the gluten=free flour. Cook and stir for about 30 seconds until it thickens. Slowly add in the rice milk, whisking to blend it with the flour paste. Bring the mixture to a bubble then reduce the heat to low. Add the nutritional yeast, sea salt, garlic powder, lemon juice, turmeric, rosemary and wine; whisk to blend. Spray your casserole dish with Pam or other non-stick spray. Layer half of the sliced potatoes in the bottom of the dish. Pour half the sauce over this layer. Add in the remaining potatoes and pour the rest of the sauce all over the top. Bake for 50 minutes. Serves 4. I often take vegan recipes & products and add meat to them to accommodate my allergy to dairy. Dairy can sometimes cause me digestive problems. My husband can’t eat gluten without it causing gastric distress and really bad psoriasis on his hands. This is a collection of my recipes that either accommodate me and/or my husband.